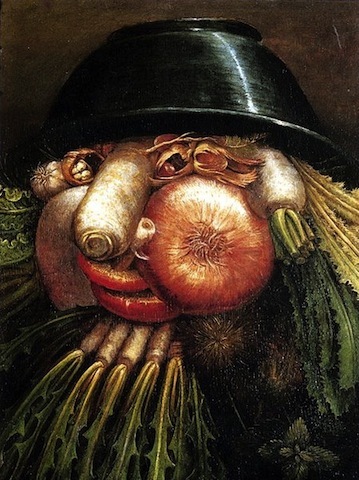 Giuseppi Arcimboldo (1527 – 1593) is one of those fascinating artists who can’t be put in one box. 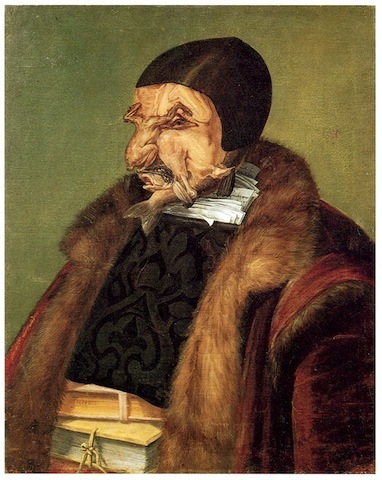 The self-portrait below is competent but pedestrian: “This is what I look like.” No doubt, but so what? A self-portrait should be about inner states. 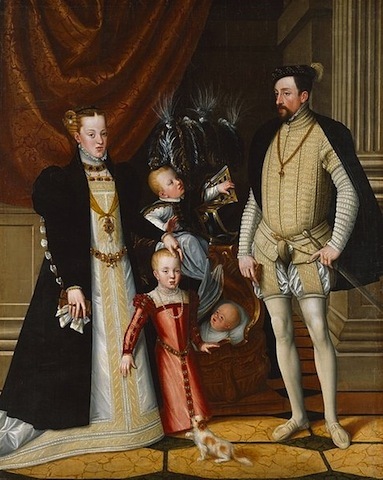 His portrait of the Emperor Maximilian and family, an early work, is charming but almost naive. The figures read like a group of cutouts pasted down on the background. The composition is iffy (that jumble of children!). There are parts that are not badly painted, but the pieces don’t cohere. It seems the work of a pretty-well trained craftsman, without genius. But then we encounter his later, fantastical work. He’s made a great advance in craft — how to make a piece hang together and give it presence — but imagination is the big hit now. 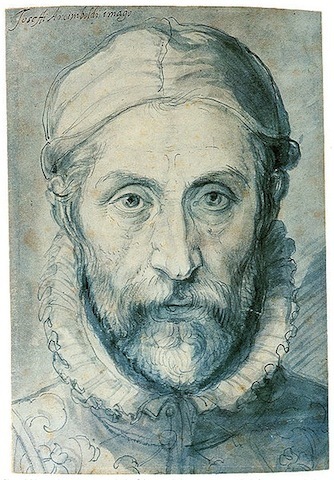 In this vein he did many wonderful images of the seasons and the elements, and fantastic portraits. The manipulation of objects into complex images is a gimmick, but the images aren’t just gimmicky. A piece like Winter has an attitude somewhere between funny and something else. 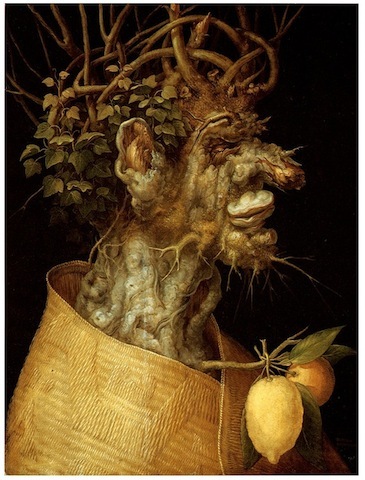 Arcimboldo’s intention is subtle enough to leave you plenty of space to wonder about it, and try on your own interpretations. You see it differently if you come to it in different moods and different states of mind. This is uncommon even in the best art. 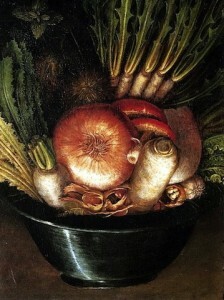 And then a late piece: the bowl of vegetables, turned upside down, becomes The Greengrocer. It’s a playful concept, but the result is not quite playful. There’s an edge to it. Look at the eyes and the mouth: the expression is reminiscent of Henry Tonks’ disfigured soldiers (July 9) — of someone way inside, looking out. And having had that thought, if I go back to the self-portrait I see less dullness, and more calculated reserve — more tension, more distance — than there seemed at first. Perhaps that really was what he was like. This entry is a reprise of March 12, 2012.